So, you’ve decided to set up a backyard projector, or may have already done it, but need some info on the projector lamps? Worry not, we’ve got you covered. This article is meant to explain just what projector bulbs are, how they work, and why you need to be careful to choose the right one. First thing’s first – let’s get into the inner workings of a projector, and especially, a projector bulb. There are two types of projectors, LCD and DLP. The first type uses a prism to break down the light into individual colors, after which the signal is sent through small LCD panels, and then through a lens onto the screen you’d set up. The second type is a bit different, in that it beams the light through a spinning color wheel onto a chip containing numerous small mirrors. The needed color is filtered here, and then beamed through a lens onto a screen. LCDs are better employed for static or high-contrast images, whereas DPLs are better when you need vivid colors. How Long Does a Projector Last? How do I know when it is time to change my lamp? How can I make my lamp last longer? As you may have noticed, both need a light source. This is where the projector bulb jumps in. Technically speaking, most of the projector bulbs/lamps are cousins of your average street lamp, in the sense they utilize an ARC gap filled with pressurized mercury vapor, through which the lamp sends an electrical current to produce bright light. The light is, in turn, shone onto the above mentioned LCD or DLP panels and projected so we can see it. First we have to differentiate between two things – the complete projector lamp module and bare projector lamps. While it is possible to buy a bare bulb on the open market and replace it within the used housing, many manufacturers and dealers discourage the customers from this practice. The complete module would consist of a bare bulb (which will be discussed shortly), the housing (module), and the connectors. The housing, it is worth noting, is made of high-temperature resistant plastic, like you find in your wall sockets. The lamp itself has several major components: the ARC Tube (or high intensity discharge bulb), the Mercury Vapor, the Electrical Wiring, the Quartz Globe, and Connectors and Fasteners. Simply put – supply and demand. They are profitable for manufacturers (and dealers), they are produced in limited quantities, and there are no (official) third party alternatives. You have to keep in mind, though, that the technology and materials going into making these aren’t cheap, either. It’s important to know that you, as a customer, have a choice. You can choose between buying an OEM bulb (Original Equipment Manufacturer) and an OEM-equivalent. Each of the options has benefits and risks. The OEM bulbs have the longest lifespan and guaranteed quality, but they do come at a higher price and are of limited availability. It’s exactly this limited availability that affects the price. The OEM-equivalents, although not coming from the same manufacturer as your projector, are nonetheless compatible, as well as less pricy, and due to more companies producing them, they are more available. However, they have an unpredictable lamp life, and this is their main disadvantage. For all you know, you’re buying a cat in a sack (or a pig in the poke). The bulbs usually differ according to the medium they use for the electric current to flow through. There are, of course, the classic UHP Mercury lamps, and the newer, and more expensive, Xenon lamps. The latter type is rather short-lived compared to the former, but ostensibly, yields a better color range. These are the two types most used for projectors. Typically, a projector’s life span depends on the bulb itself. Usually, a standard UHP Mercury lamp will be good for 1500 to 5000 hours of projection. As soon as you notice that the projector image seems dimmer, it’s time to start thinking about replacement. It doesn’t have to be the exact same moment, but it’s good have options ready. There are a few ways to extend your lamp’s life-cycle. Even though the materials used for making the lamp are resistant to high temperatures, that doesn’t mean they’re invincible, so make sure the area around the projector is well ventilated. That’s one. Two, every product’s life can be extended by proper maintenance, so make sure you clean the dust that builds up. Best results are achieved by vacuum-cleaning twice a month. Moreover, you also need to regularly clean and change the filters that keep the dust out of the circuitry. If clogged, they constrict the airflow, and contribute to overheating. This also applies to areas around the projector. Provided your projector has this feature, use Lamp Economy Mode. This will reduce brightness, but lengthen the lamp’s life. Never unplug your projector before allowing the fan to turn off. Also, avoid shocks to the poor thing, as well as exposing it to the elements. In a nutshell, prevent overheating and overvoltage conditions. The Electrified ELPLP54 V13H010L54 is a replacement lamp from Electrified Lamps meant for Epson Projectors. The whole setup features a generic housing compatible with Epson projectors. Some of the models encompassed are as follows: EB-S7; EB-S72; EB-S8; EB-S82; EB-W7; EB-W8; EB-X7; EB-X72; EB-X8; EB-X8E; EH-TW450; EX31; EX51; EX71; PowerLite HC 705HD. The bulb should work fine, although, being an OEM-equivalent, it’s less quality than an original Epson product replacement. There are many reviews, some praising it, others not so much (remember what we said about the pig in the poke? ), but the overall consensus is that the bulb works fine, apart from being slightly dimmer than the original. This may not be the best replacement out there, but if you are working under a strict budget, it should prove sufficient, as it fits an impressive range of Epson projectors. 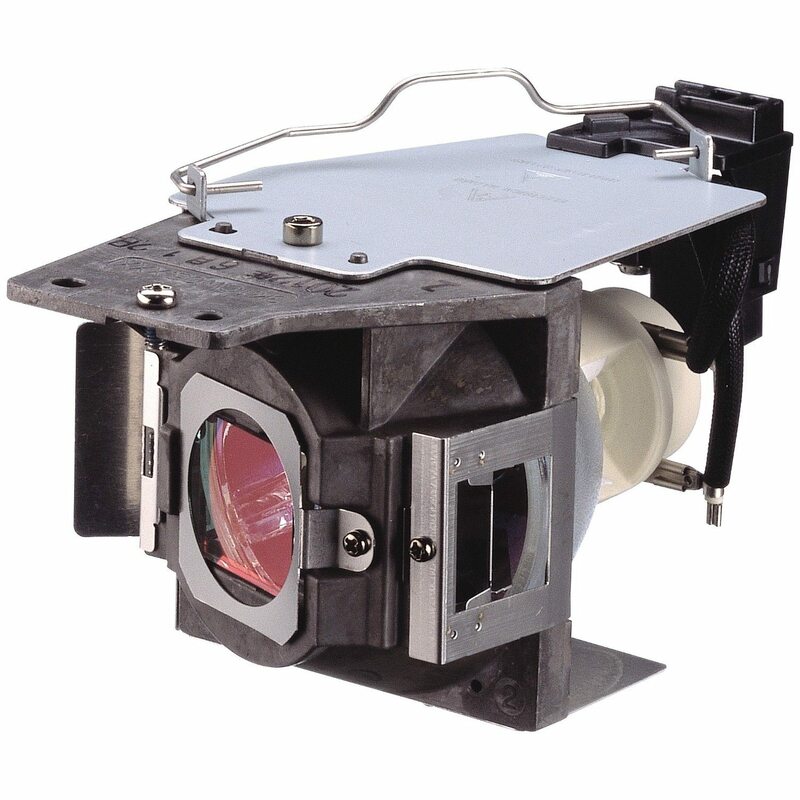 The BenQ 5J.J7L05.001 is, as the label declares, an OEM replacement lamp for BenQ projectors. The label states it fits W1070 and W1080ST series of projector models, but should also be compatible with other models without any jerry-rigging, such as BenQ 1075, BenQ1040 and HT1085ST, and multiple others. The estimated life-span of this product is more or less the same as for the standard BenQ original, but do keep in mind this is a replacement. You will probably be able to get at least 2000 hours of projection out of it. Apart from the shape of the bulb itself, there should be no differences between your original and this replacement, particularly (and hopefully) regarding quality. Still, keep in mind this is a replacement, so it’ll never reach the same standard as the original. On the other hand, the price is moderate. Out of all three products on this mini-list, the Lampedia Replacement Lamp comes with the highest price-tag. It’s designed and manufactured by ViewSonic, and therefore considered an OEM part. It’s compatible with a fair number of ViewSonic projectors: PJ400 / PJ400-2 / PJ452 / PJ452-2. The lamp features generic housing, so it stands to reason you could use it for other models of the same manufacturer. The bulb is meant for LCD projectors, and requires 165W wattage. The life-span covers 2000 hours on STD, and double that on ECO setting. The product comes with a warranty that covers a period of 180 days (or six months). There aren’t many reviews as of yet, so it’s still a bit of an unknown. On the other hand, the warranty may be taken as some indication of quality and confidence. Before doing anything, make sure your projector is unplugged and has cooled at least an hour. Don’t touch the bulb with your bare hands, as oil on your skin will shorten the lamp’s life. Your bulb is located underneath a rectangular plate, usually on the bottom of the projector. This is the cover of your lamp, and it’s usually secured by two screws. Unscrewing them will reveal the bottom of the plastic module that houses the bulb. Removing it is a simple matter of pulling it out gently by holding the attached handle. Next, place the replacement, and screw everything down. Use this occasion to also change your filter. Finally, reset the lamp hour-counter in the projector menu, and you’re good to go.